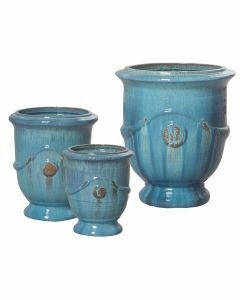 This lovely ceramic garden pot features a blue glaze finish. The M/L pot 24" Dia x 19.5" H. measures Click on images for greater detail. 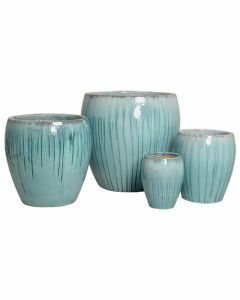 Please note the color, glazes, texture and the finishes shown may vary from the item shipped. 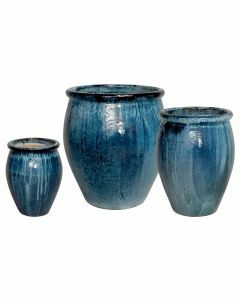 All handcrafted items and ceramic pieces will have some degree of variance in color, size and finish due to production limitations. These variations add to the character of the design and create the uniqueness and individuality of each piece. This item ships via freight. Freight charges calculated during checkout are approximate and additional freight charges may apply depending on your location. If you are interested in purchasing this item, please call us or email Customer Service for a shipping estimate. If you are a member of the trade, please join our Trade Program for discounts on this item.